How Committed Are You To Your Marriage? 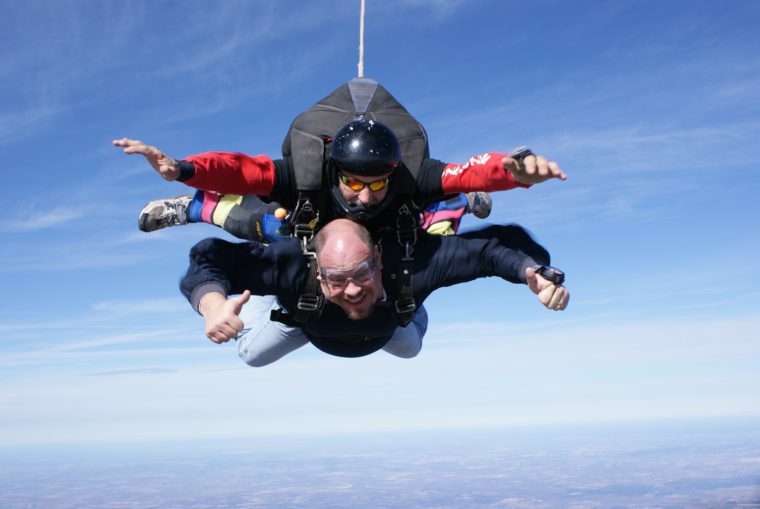 Roy was over 10,000 feet hanging out the side of plane when he heard the instructor say, “3….2…1…Go”. The guy before him had backed out… sat on the edge until someone pulled him back in toward the back of the plane. The time of decision had arrived. Was Roy going to be “All In” or wait for another opportunity? He jumped. There are few experiences that give a person the incredible rush of traveling 120 miles per hour in free fall or the wonderful experience of gliding through the air peacefully with the beauty of the sky and earth around you after your parachute deploys. But you will never experience them if you don’t jump. If you are not “All In”, you will not know the joy of the experience. The same is true for commitment in your relationship. We have written previously about the importance of three-legged table upon which your marriage sits. Passion, Connection, and Commitment are each just as essential as the other. One of the critical ingredients to having the marriage you have always wanted is commitment. In a study published in 2009 by Rusbult, C. E., Kumashiro, M., Kubacka, K. E., & Finkel, E. J. (2009). “The part of me that you bring out”: Ideal similarity and the Michelangelo phenomenon. Journal of Personality and Social Psychology, researchers assessed marriage commitment using the following scale. Score between 0 and 8 with 0 being “I do not agree at all” and 8 being “I agree totally”. I will do everything I can to make our relationship last for the rest of our lives. I feel completely attached to my partner and our relationship. I often talk to my partner about what things will be like when we are very old. I feel really awful when things are not going well in our relationship. I am completely committed to maintaining our relationship. I frequently imagine life with my partnering in the distant future. When I make plans about future events in life, I carefully consider the impact of my decisions on our relationship. I spend a lot of time thinking about the future of our relationship. I feel really terrible when things are not going well for my partner. I want our relationship to last forever. There is no chance at all that I would ever become romantically involved with another person. I am oriented toward the long-term future of our relationship (for example, I imagine life with my partner decades from now). My partner is more important to me than any one else in life – more important than my parents, friends, etc. I intend to do everything humanly possible to make our relationship persist. If our relationship were ever to end, I would feel that my life was destroyed. Add up your scores. The closer to 120 you are, the more committed you are to your marriage. If you are less than 90, you have opportunities in growing your commitment level. Higher levels of relationship dissatisfaction. Significantly higher experience of abuse. Significantly higher chance of divorce. Couples with moderate to low levels of commitment never reach the levels of intimacy that totally committed couples experience. Lack of commitment effects physical and emotional intimacy. The brain actually reacts differently when we are in a committed relationship and when we are not. What Keeps You From Being All In? Fear Of The End – If you are someone who is afraid your relationship will end up being like a horrible one that you observed growing up or that a friend went through, you may think you need to try the relationship before committing by cohabitating. However, not committing actually creates the problems that lead to the relationship ending. Couples who cohabitate are 80% more likely to end before marriage and cohabitating couples who marry are more likely to divorce than couples who never cohabitated. “What if…” Thinking – Day dreaming or fantasizing about relationships that could have been or have a possibility of becoming actually keeps you from being fully committed. “What if…” thinking leaves your heart with an open door to someone else. Plan For The Worst – When you try to keep the door open to another potential relationship if this one fails, you might think you are planning for the worst, and hoping for the best. But instead you are failing to do the things necessary to make this relationship work. Selfishness – If you focus solely on what you can get out of the relationship you will do the things that causes your relationship to end. If you wait for your spouse to fully commit before you do, you will likely drive them away from you with your lack of commitment. When you “forsake all others until death do you part”, you will discover the benefits of the type of marriage relationship you have always dreamed about. You will begin to create the relationship of your dreams. And when the roller coaster of life sends your relationship to a big dip, you will find the courage to stay with and work it out. We love to hear from readers. What did you find helpful about this article? Were you surprised at how you are holding back from commitment? What recommendations would you add to strengthen commitment? Do you know someone who you need to forward this article to?